The 1961 Goldsboro B-52 crash was an accident that occurred near Goldsboro, North Carolina, on January 24, 1961. A B-52 Stratofortress carrying two 3–4-megaton Mark 39 nuclear bombs broke up in mid-air, dropping its nuclear payload in the process. The pilot in command ordered the crew to eject at 9,000 feet (2,700 m). Five crewmen successfully ejected or bailed out of the aircraft and landed safely, another ejected but did not survive the landing, and two died in the crash. Information newly declassified in 2013 showed that one of the bombs came very close to detonating. The aircraft, a B-52G, was based at Seymour Johnson Air Force Base in Goldsboro. Around midnight on January 23–24, 1961, the bomber had a rendezvous with a tanker for aerial refueling. During the hook-up, the tanker crew advised the B-52 aircraft commander, Major Walter Scott Tulloch, that his aircraft had a fuel leak in the right wing. The refueling was aborted, and ground control was notified of the problem. The aircraft was directed to assume a holding pattern off the coast until the majority of fuel was consumed. However, when the B-52 reached its assigned position, the pilot reported that the leak had worsened and that 37,000 pounds (17,000 kg) of fuel had been lost in three minutes. The aircraft was immediately directed to return and land at Seymour Johnson Air Force Base. As the aircraft descended through 10,000 feet (3,000 m) on its approach to the airfield, the pilots were no longer able to keep it in stable descent and lost control. The pilot in command ordered the crew to abandon the aircraft, which they did at 9,000 feet (2,700 m). Five men landed safely after ejecting or bailing out through a hatch, one did not survive his parachute landing, and two died in the crash. The third pilot of the bomber, Lt. Adam Mattocks, is the only person known to have successfully bailed out of the top hatch of a B-52 without an ejection seat. 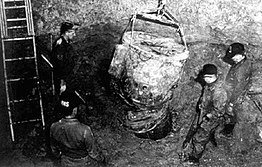 The crew's final view of the aircraft was in an intact state with its payload of two 3-4-megaton[a] Mark 39 thermonuclear bombs still on board; however, the bombs separated from the gyrating aircraft as it broke up between 1,000 and 2,000 feet (300 and 610 m). The aircraft wreckage covered a 2-square-mile (5.2 km2) area of tobacco and cotton farmland at Faro, about 12 miles (19 km) north of Goldsboro. Three of the four arming mechanisms on one of the bombs activated after it separated, causing it to execute many of the steps needed to arm itself, such as charging the firing capacitors and deploying a 100-foot-diameter (30 m) parachute. EOD personnel work to recover the buried Mk. 39 thermonuclear bomb that fell into a Faro, NC field in 1961. Until my death I will never forget hearing my sergeant say, "Lieutenant, we found the arm/safe switch." And I said, "Great." He said, "Not great. It's on arm." Wet wings with integral fuel tanks considerably increased the fuel capacity of B-52G and H models but were found to be experiencing 60% more stress during flight than did the wings of older models. Wings and other areas susceptible to fatigue were modified in 1964 under Boeing engineering change proposal ECP 1050. This was followed by a fuselage skin and longeron replacement (ECP 1185) in 1966, and the B-52 Stability Augmentation and Flight Control program (ECP 1195) in 1967. In 2011, Lt. Jack Revelle, the bomb disposal expert responsible for disarming the device, claimed "we came damn close" to a nuclear detonation that would have completely changed much of eastern North Carolina. He also said the size of each bomb was more than 250 times the destructive power of the Hiroshima bomb, large enough to create a 100% kill zone within a radius of 8.5 miles (13.7 km). 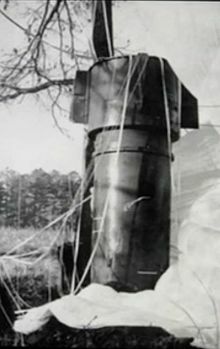 In a now-declassified 1969 report, entitled "Goldsboro Revisited", written by Parker F. Jones, a supervisor of nuclear safety at Sandia National Laboratories, Jones said that "one simple, dynamo-technology, low voltage switch stood between the United States and a major catastrophe", and concluded that "[t]he MK 39 Mod 2 bomb did not possess adequate safety for the airborne alert role in the B-52". However, Michael H. Maggelet and James C. Oskins, authors of Broken Arrow: The Declassified History of U.S. Nuclear Weapons Accidents, dispute this claim, citing a declassified report. They point out that the arm-ready switch was in the safe position, the high-voltage battery was not activated (which would preclude the charging of the firing circuit and neutron generator necessary for detonation), and the Rotary Safing Switch was destroyed, preventing energisation of the X-Unit (which controlled the firing capacitors). The tritium reservoir used for fusion boosting was also full and had not been injected into the weapon primary. This would have resulted in a significantly reduced primary yield and would not have ignited the weapon's fusion secondary stage. Road marker in Eureka, NC, commemorating the 1961 B-52 crash. In July 2012, the State of North Carolina erected a historical road marker in the town of Eureka, 3 miles (4.8 km) north of the crash site, commemorating the crash under the title "Nuclear Mishap". The memorial does not list the names of the three aircrew who died in the accident: Sergeant Francis Roger Barnish (35), Major Eugene Holcombe Richards (42), and Major Eugene Shelton (41). ^ Some sources like Ralph Lapp say they were 24 megatons, but Hansen has stated that this is definitely an error, possibly caused by a decimal point being dropped. ^ There is some uncertainty as to which of the two bombs was closest to detonation, as different sources contradict one another over this point. 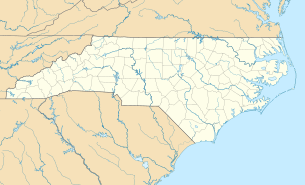 ^ "Whoops: Atomic Bomb dropped in Goldsboro, NC swamp". Retrieved 25 September 2013. ^ a b Schneider 1975, p. 28. ^ a b Sedgwick 2008. ^ a b "Goldsboro Revisited," The Guardian, 20 September 2013, accessed 20 September 2013. ^ Hansen 1990, p. 43. ^ "AF Form 14 Report of Aircraft Accident". 24 January 1961. ^ a b "Nuclear Mishap in Goldsboro". Broken Arrow: Goldsboro, NC (2000). Archived from the original on 18 June 2005. Retrieved 14 June 2005. ^ a b Sharon 2012. ^ a b Hanauer 1981, p. 28. ^ a b Hardy 2005. ^ a b c Tuttle 2013. ^ "Davis Family Easement". Ibiblio. Retrieved 12 September 2014. ^ Knaack 1988, pp. 276-277. ^ Michael H. Maggelet and James C. Oskins (5 March 2013). "Goldsboro - 19 Steps Away from Detonation". Retrieved 4 July 2017. ^ Michael H. Maggelet and James C. Oskins. Broken Arrow - The Declassified History of U.S. Nuclear Weapons Accidents. ISBN 1435703618. Hanauer, Gary (April 1981). "The Pentagon's Broken Arrows". Mother Jones Magazine: 28. Retrieved 13 July 2009. Hansen, Chuck (October 1990). "Ooops!". Bulletin of the Atomic Scientists (8 ed.). 46. Hardy, Scott (2005). "The Broken Arrow of Camelot: An Analysis of the 1961 B-52 Crash and Loss of the Nuclear Weapon in Faro, North Carolina". East Carolina University. Knaack, Marcelle Size (1988). Post-World War II Bombers, 1945–1973 (pdf). Washington, D.C.: Office of Air Force History. ISBN 978-0-16-002260-9. Retrieved 25 September 2013. Mattocks, Adam (8 February 2011). "Personal Interview". Pilkington, Ed (20 September 2013). "US nearly detonated atomic bomb over North Carolina – secret document". The Guardian. Retrieved 20 September 2013. Schneider, Barry (May 1975). "Big Bangs from Little Bombs". Bulletin of the Atomic Scientists. Retrieved 13 July 2009. Sedgwick, Jessica. "Bombs Over Goldsboro". This Month in North Carolina History (January 2008). Archived from the original on 28 December 2011. Retrieved 24 January 2012. Sharon, Keith (27 December 2012). "When two nukes crashed, he got the call (Part 2 of 2)". Orange County Register (California). Retrieved 21 September 2013. Shaffer, Josh (2 July 2012). "Shaffer: In Eureka, They've Found a Way to Mark 'Nuclear Mishap.'". News and Observer. Retrieved 2 July 2012. Tuttle, Steve. "A CLOSE CALL- Hero of 'The Goldsboro Broken Arrow' speaks at ECU". East Carolina University. Retrieved 21 September 2013. Yancy, N. (26 January 1961). "Life-Death Story of Flight Told". Greensboro News & Record. Yenne, Bill (2012). B-52 Stratofortress: The Complete History of the World's Longest Serving and Best Known Bomber. Zenith Imprint. ISBN 1610586727. Hansen, Chuck (1988). US Nuclear Weapons: The Secret History. Aerofax, Incorporated. ISBN 0517567407. Dobson, Joel (2011). The Goldsboro Broken Arrow. Lulu Press (Self published). ISBN 1257869523. The Guardian Newspaper - Account of hydrogen bomb near-disaster over North Carolina – declassified document. This page was last edited on 29 March 2019, at 17:41 (UTC).